This is not a James Blood Ulmer album. This is not a The Thing Album. If that’s only what you’re after I can highly recommend the magnificent Blood’ album ‘Tales of Captain Black’ from 1979, or The Thing’s ‘BOOT! from 2013. Furthermore, one simply cannot say what James Blood Ulmer is, as far as genres go. Is he jazz? Is he funk? Is he rock or blues? Is he ‘someone-who-took-Jimi-Hendrix-playing-to-the-next-level’? I’m just going to leave it at this: he’s James Blood Ulmer. He’s a living legend as far as breaking boundaries in cross-genre guitar playing goes. And what’s The Thing? In short – as I’m sure you all know them; it’s a tour de force jazz mulisha at its very finest, never afraid – always ready to throw bold ideas in the mix, run it over a couple of times, and spit it out. Composed by a trio musicians who’s played with everyone everywhere. Reading their individual discography is exhausting. With reedist Mats Gustafsson, (Fire! Orchestra, and releasing albums with everyone on the free jazz scene, it feels like), bassist Ingebrigt Håker Flaten (Atomic, Fredrik Nordström Quintet, Townhouse Orchestra and many, many others) and drummer Paal Nilssen-Love (Atomic, Frode Gjerstad Trio, The Peter Brötzmann Chicago tentet just to mention a few) – The Thing is …The Thing. But it is also a band which happens to often meet with their heroes, live and on tape. We, fans of The Thing, have been blessed with great releases such as Immediate Sound (2001, with Ken Vandermark), Collider (2016, with DKV Trio) and Metal (2012, with Barry Guy), just to mention a few. 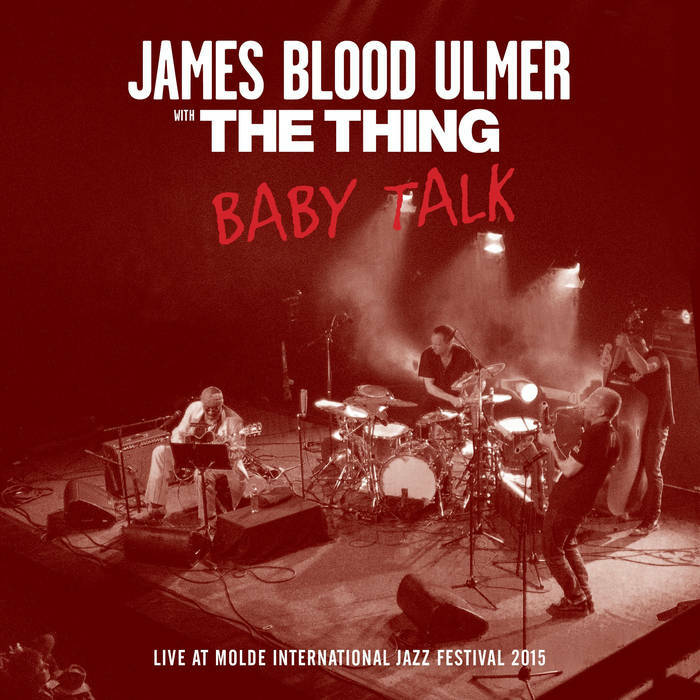 In that aspect it’s not that surprising to see James Blood Ulmer taking the stage with The Thing during the 2015 Molde International Jazz Festival. Before listening to this album I sat for a while just staring at the cover. What was this going to be like? I was starting to feel afraid that on this album I would hear The Thing either eat Ulmer alive, especially live, with Mats Gustafsson leading the way like a rabid dog. Or that The Thing would fall flat, not knowing how to see eye to eye with the legendary Ulmer. But all these feelings are of course silly, knowing what these people are capable of, on their own – or with others. What was there to worry about? On this album I hear nothing else than the greatest of respect to what James Blood Ulmer is, whatever that is, and also with the soul, passion and force that is The Thing, intact. The 4 original Ulmer compositions are all treated with great care albeit twisted, turned and re-invented. It starts off with ‘Interview’. Ulmer introduces the theme which is a dissonant run of notes which Ingebrigt Håker Flaten follows just behind, like a chase. It’s very elegant. We’re not left with who’s winning though, Flaten leaves Ulmer for another direction and changes the pace. He’s inviting the others to the party. Nilssen-Love and Gustafsson jumps straight in. The elegant chase is transformed into an intense dance. Ulmer’s not late to join The Thing in their typical way of playing while still keeping his distinct and personal tone. Second song ‘High Yellow’ is also introduced by Ulmer, however this time there’s less patience shown before The Thing picks up the pace to start twisting the song around. Nilsson-Love can really be heard like the master he is in this song. He’s got such a big sound, yet I love how he’s a participator and a creative force throughout the album. However Ulmer’s never left alone, and is never drowned. Mats joins and immediately brings his best lyrical playing to the table. They all bring on the full intensity for a couple of minutes, making sure they’ve explored every corner of the song, before eventually they start to stumble, almost like rolling an uneven stone down a hill, towards those last notes. Ulmer closes the song and I wonder where this is going. I couldn’t have expected what was to come. 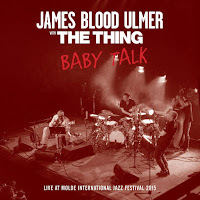 Ulmer introduces a kind of naïve tune, or something from a children’s songbook – ‘Baby Talk’ is the name of the third song. The Thing accepts the challenge and starts the adventure with changing around the tune in different directions. You can always here Ulmer right there, he never misses a note, even when Gustafsson brings on his best (worst?) nightmare. Eventually we’re brought back to the original theme and it’s over. The last song ‘Proof’ is one scary yet fantastic piece of music. It’s lyrical, simple, bluesy, dark, sad and absolutely brilliant. I sat like on needles waiting for Mats to join in. He does, but perhaps not like you’d think. Not together with Flaten and Nilsson-Love, not like a speeding train, and not alone like a whirling dervish in some manic mental state of mind. The Thing waits patiently while Ulmer sets the stage before Mats edgy baryton starts to sing together with Ulmer; moaning & calling. Ingebrigt’s bass is heard surrounding them like someone walking right beside them. Is he a friend or a foe? Mats pleading and calling builds up with increasing intensity while Ulmer keeps playing the theme repeatedly, with small varations. About half-way through the song, scene changes. The tension that has been built up must be released. There’s no other solution than to ask for help. Nilsson-Love to the rescue. He’s leading the way, guiding Ulmer, Gustafsson and Flaten back to safety. We’re left with that great feeling you get after hearing something very special. If only there was more songs. 33 minutes is not enough. I’m not sure there will be that many opportunities to hear James Blood Ulmer & The Thing together again, if ever. Having said that, I highly recommend that you pick this one up. Fair question. This was a 'meet' during the 2015 Molde Jazzfestival; thus this set was part of the festival and not as a stand-alone concert. That explains the brevity of the album itself. I was intrigued by this as soon as I saw it on the Trost site. What makes The Thing so special on collaborations with other dominant personality musicians is that they are such good listeners and able to direct the music into unexpected paths. I've been frustrated with Ulmer's earlier releases in that they don't have enough synergy among the participants; no problem here. I couldn’t agree more. There’s no competition on this album, only propelling forces that developes Ulmers ideas further.